UPDATE: BUY THE ZENFONE 2 NOW FROM AMAZON! The ASUS Zenfone 2, a phone first introduced to the world waaaaaaay back at CES in January, is finally arriving on US soil. During a press event that took place this morning in NYC to announce US availability, ASUS said that it would go on sale starting tomorrow for $199 and $299 at retailers like Amazon and Newegg. As a recap, the Zenfone 2 is a high-end-like phone with an extremely affordable price. ASUS is selling it as an unlocked device that should run just fine on AT&T and T-Mobile’s LTE networks. 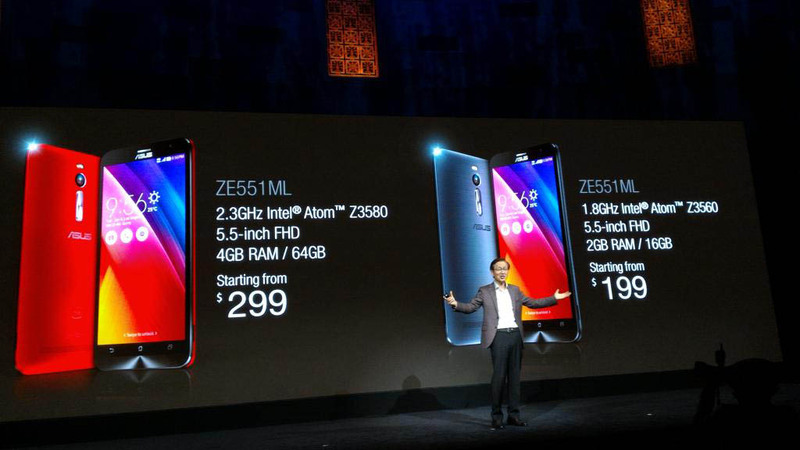 The Zenfone 2 features a 5.5-inch FHD (1080p) display that takes up 72% of the phone’s front, Gorilla Glass 3, has 2GB ($199) or 4GB ($299) RAM, 16GB or 64GB of storage with microSD slot, 3,000mAh battery with quick charging (60% in 39 mins), 13MP rear camera, 5MP front camera, and runs Android 5.0 Lollipop. It’s also powered by either a 2.3GHz or 1.8GHz 64-bit Intel Atom quad-core processor. The $299 4GB version of the phone comes with the 2.3GHz Intel Z3580, while the $199 2GB version comes with the 1.8GHz Z3560. For that price, you are looking at a hell of a phone. Again, the Zenfone 2 goes on sale in the US tomorrow at Amazon, Newegg, B&H Photo, and Groupon.